Are you running a WordPress membership or e-commerce website? With the new editor you might be wondering how to show or hide Gutenberg blocks to logged in users only or perhaps the opposite: how to restrict visibility for NON-logged in users. In this post, I’ll help you save your time coding, so you can focus on your store instead. I’ve provided several easy steps on how you can manage blocks visibility using Block Options plugin. It’s a free WordPress Gutenberg management tool which is available on the plugin directory. Just follow the step-by-step guide below on to show or hide Gutenberg Blocks to logged in/out user state in no time. To get started you need to download Block Options first. Alternatively, you can get it on the plugin directory. After you’ve activated Block Options, go ahead and edit the posts or pages in the blocks that you want hidden. Otherwise, create a new one. Now, select the block that you need to show or hide on logged-in/out user state. 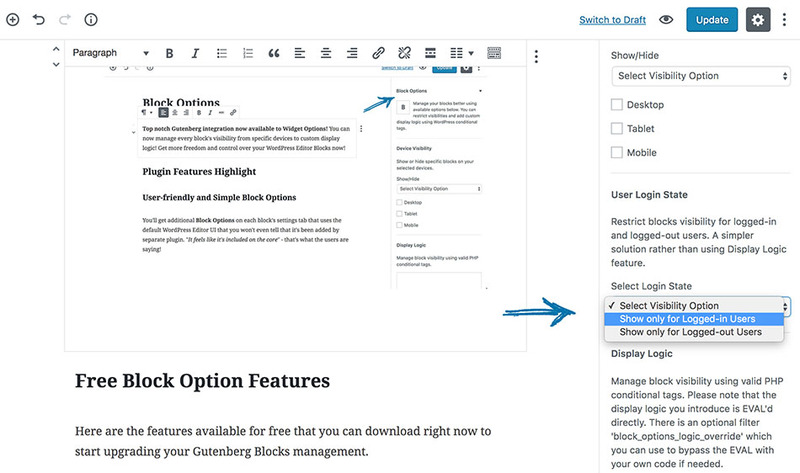 Then click the “Block” settings tab available on the Gutenberg sidebar settings. Under User State, select the visibility option you want the block to have. And you are done! Just repeat those steps when you have other blocks to restrict on user states. Do not forget to save your changes. There are other helpful features that you can get aside from user state restriction. To explore other features, just navigate to Settings > Block Options. You can also check How to Hide WordPress Gutenberg Editor Blocks on Mobile Devices tutorial. I highly suggest you check the Display Logic feature, too! That’s it! Enjoy managing your Gutenberg blocks with Block Options!